A new £1m factory extension has been unveiled today by PP Control & Automation as it singled its intention to double sales from £20m to £40m by 2021. 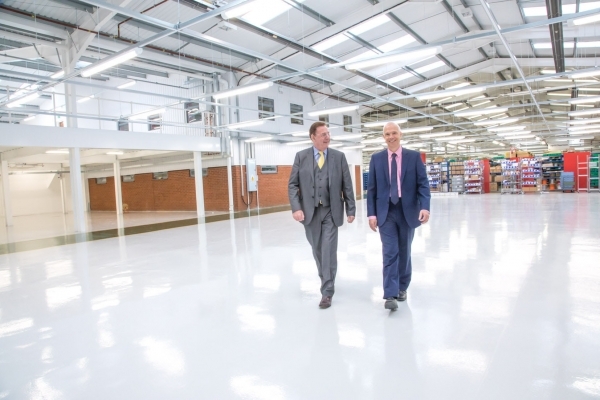 The company, which works with many of the world’s most successful machinery builders, had added a further 1,000 sq metres of production space to its existing 4,500 sq metre facility in Cheslyn Hay, in order to facilitate growth in new technology markets and interest from a wider international customer base. With construction completed on time, work is now underway to kit out the dedicated logistics and material department with conveyor systems and state-of the-art barcode scanning to ensure goods are moved around the shopfloor quickly and efficiently. Also planned is a new ‘clean assembly’ area that will cater for an increasing need to assemble static sensitive electronics, as well as intricate mechanical parts that have more specialist assembly requirements. “We have very ambitious growth plans to double turnover and this will only be possible by ensuring we have a facility in the UK that can provide us with the space needed to meet our current and future customer requirements,” explained Tony Hague, Managing Director. “The £1m investment, in the immediate light of the Brexit vote, shows our commitment to creating a world class operation and we will showcase our new capabilities to clients in the food processing & packaging, machine tool, medical, printing, semiconductor and scientific machinery sectors. PP Control & Automation, which is a member of the Manufacturing Assembly Network (MAN), has become one of the world’s largest and most respected suppliers of electrical control systems, cable harnesses and sub-contract manufacturing solutions. The company has benefitted significantly from the ‘outsourcing’ trend being employed by machinery builders keen to reduce production lead times, secure greater manufacturing flexibility and ultimately reduce overall manufacturing costs and increase profitability. “It’s not just investment in bricks and mortar either,” added David Fox, Chairman of PP Control & Automation. PP Control & Automation will hold a special event to mark the official opening of the extension later his year, as part of its 50th anniversary celebrations.